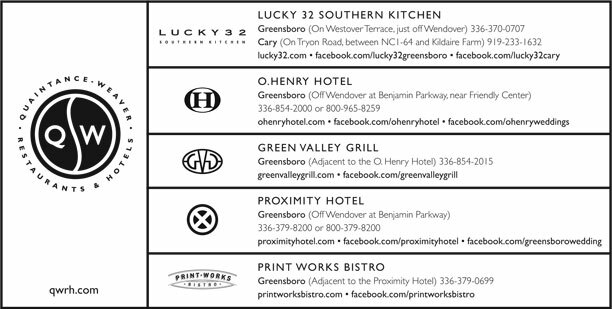 We are in a race to finish the Proximity Hotel and Print Works Bistro, which will open late summer/early fall. Like a lot of races around here, sometimes we feel like we’re going in circles! Read on, and you’ll get some news about that, some bragging about a few of the amazing people with whom we get to work, and some special happenings at the O.Henry Hotel, the Green Valley Grill and the Lucky 32 restaurants. refrigerated with the assistance of geothermal technology. There’s a lot more news along these lines, but we’ll save that for a future letter. For now, we’ll just speculate that the Proximity will meet the U.S. Green Building Council’s Leadership in Energy and Environmental Design (LEED) Gold level. We love summer because it brings “the farm closer to the fork”– at least closer to the forks in our restaurants! We are delighted to buy food from farmers and food makers from right in our own backyard. During the next few months, we will purchase bunches of produce from Eastern Carolina Organics’ network of thirty-some farms. In addition to those farms, we use several other local and/or sustainable food providers: Giacomo’s, Old Mill of Guilford, Counter Culture Coffee, Goat Lady Dairy, Red Oak Brewery, Carolina Classic Catfish, Chapel Hill Creamery and several North Carolina wineries. Our chefs are having buckets of fun creating (and tasting) new recipes that feature local food. You’ll see these menu selections popping up this summer. Playing with our menus has been especially fun because working with Bart Ortiz, who leads our “farm to the fork” initiative, is always wonderful and because we recruited our good friend Mark Furstenberg to help. He is a two-time James Beard Foundation nominee as “Best Chef in the Mid Atlantic” for his work at his Washington, DC icon restaurant, Breadline. He started the bread baking instruction program at the Culinary Institute of America at Greystone, and he is starting a similar program with the National Culinary School of Spain. We are in good company in seeking Mark’s help since he also works with Thomas Keller of the French Laundry and Michel Richard of Citronelle. Outdoor dining season is in its prime! Enjoy the gardens of our outdoor dining rooms at the Green Valley Grill and both Lucky 32s. They are all delicious spots to enjoy an alfresco lunch meeting, a leisurely dinner or a late-night snack. And just in case you didn’t know, we serve brunch on Sundays starting at 10 a.m. at Lucky’s and 9 a.m. at the Green Valley Grill. We also serve brunch on Saturdays at Lucky’s starting at 11:15 a.m. FYI: Lucky’s in Cary is now completely smoke-free, inside and out! We are so lucky to have the nationally recognized Eastern Music Festival (easternmusicfestival.org) in Greensboro! This year, they have a whopping 100+ events between June 23 and July 28, 2007. After a concert, make it an extra special occasion by spending the night at the O.Henry. Our Music to Your Ears Package includes one night’s gracious accommodations for two, afternoon tea, a box of imported chocolates, a bottle of wine, the O.Henry Cheese Trio, $30 credit toward dinner at Green Valley Grill, complimentary transportation to the concert, a hot buffet breakfast and a late check out for only $269. But wait, there’s more! The first five folks to book this package for Saturday, July 22 will receive two complimentary festival tickets to see Bruce Hornsby that night. Please call reservations at 336-854-2000. If you snooze, you’ll lose! Bring the kids for our Family Getaway Package during the month of July. This extra special deal includes one night’s gracious accommodations for up to four, two tickets to the nearby Children’s Museum or the new Animal Discovery Park at the Nature Science Center, transportation to the museum or park, milk and cookies for the kids, the O.Henry Cheese Trio for the parents, and a hot buffet breakfast, all for $199. Extra tickets are available. Please call reservations for details at 336-854-2000. Celebrate July 4th in style with our special Fireworks Package on July 1-8. This package includes one night’s gracious accommodations, a $30 voucher for Green Valley Grill or Lucky 32 and a bottle of champagne or wine in your room. Plus, if you stay with us on July 4th, you can get a guestroom with a view of the big fireworks show (only a dozen of these rooms are available and we will do the anti-rain dance). On the other nights, we’ll leave the “fireworks” up to you! All of that is only $159. Please call reservations at 336-854-2000. For more summer sizzlers and to get our “Best Rate” for any day of the year, please go to ohenryhotel.com. Jim Slowin stepped into the role of Operating Partner at the Green Valley Grill in April. Jim is an amazing guy. He joined our team nearly 18 years ago after graduating from the University of Iowa (Go Hawkeyes!). He quickly worked his way up from server to general manager of Lucky 32. For the last decade, he has overseen all of our restaurants as Vice President of Operations. Bart Ortiz, who has led our culinary team for the past decade, will be the Executive Chef and Operating Partner for Print Works Bistro. He is dedicated to this task, even to the extent of making the sacrifice of “studying” restaurants in many cities over the past year, including Paris (poor guy!). Bart joined our team as a line cook while in college. Then he went off to Indiana University and taught high school for a while before he rejoined this team. Cassandra Brown has been leading the hard-working housekeeping team at the O.Henry since 2000. A native of eastern North Carolina, she spent eight years in the Army. This sharp cookie is now going to school part-time at Guilford College to complete her B.A. in Business Administration. Andrew Lofaro moved from Palm Beach, Florida to become the General Manager at Lucky 32 in Greensboro last November. He brings lots of energy, wonderful ideas and 16 years of experience from some great restaurant companies. Martha Bryant joined our team in 1993 (Ms. Schroeder then) and we’ve been friends with her even longer than that. She’s played every leadership role in our company except for executive chef. She really is an incredible person. She opened the O.Henry Hotel as the General Manager in 1998 and took the helm of our sales effort in 2004. Leigh Hesling sailed into Green Valley Grill as Executive Chef two years ago. Before landing in North Carolina, this Australian spent five years as the executive chef on some pretty impressive cruise ships and a stint as a sous chef on the QE2! Since he grew up on a farm in Australia, he loves using local ingredients as often as possible. Taste some of his current fresh creations like the grape leaf wrapped salmon. Patrick Lang and his wife moved to Greensboro in 2005 from Washington, DC to join this team and to be closer to family. In Washington, he was the general manager of a boutique hotel, and before that he was a part of the leadership team at the Boulevard Restaurant in San Francisco. Patrick will play the role of General Manager at the Proximity Hotel. Heather Barber is way creative and working with her is way fun! She’s been a sales manager at the O.Henry Hotel since 2002. Her specialty is creating the most amazing weddings, bar/bat mitzvahs, and other social gatherings. She even built a tree in the middle of the Caldwell Room for one fundraiser. Watch out Proximity… here she comes! Jay Pierce moved his wonderful family up this way last year from central Florida to become the Executive Chef of Lucky 32. A New Orleans native, this talented chef brings many years of culinary expertise, including a stint with Emeril’s. He’s been sneaking some Creole flavors in the Lucky’s menu in both Greensboro and Cary. Have you tried his spicy voodoo glaze? Martin Hunt has been a familiar face around the Green Valley Grill dining room and event spaces, playing the General Manager role since July 1999. When Jim took the reins there in April, Martin moved down the street as General Manager of Print Works Bistro. He is busy putting together operation plans for the dining room and the Proximity’s beautiful events spaces. Sherrill Baker arrived just two weeks before the O.Henry opened in 1998, so she knows the hotel inside and out. After an impressive academic career at the University of North Carolina at Chapel Hill, she worked for several top flight hotels including the Siena and the Woodlands Resort. Since 2005, she has been General Manager of the O.Henry. Andy Corona’s first job was washing dishes at age 14 in a pizza joint in Boston. Since then, he has worked in every position in a restaurant. He moved from Cape Cod a few years back, and he became General Manager of Lucky 32 in Cary in September 2006. In a bowl combine breadcrumbs, thyme and pepper. Drizzle goat cheese with extra virgin olive oil. Cover cheese in breadcrumb mixture and bake in a moderate oven until golden brown. Serve on a bed of seasonal greens with a vinaigrette of your choice (go to lucky32.com for recipes). Every so often, the menus at Lucky 32 and Green Valley Grill change to take advantage of seasonal foods. Please visit lucky32.com and greenvalleygrill.com for the current menus.